The Duchess of Cambridge is to attend a banquet during the Chinese State Visit this autumn meaning we get another chance to see Kate do diamonds. Since her marriage, this particular royal has been rather shy when it comes to dipping into the family jewellery box but a gala dinner means tiaras and no duchess likes to pop one of those on her head without a few more sparklers to balance things up. Kate is about to get very glittery indeed. 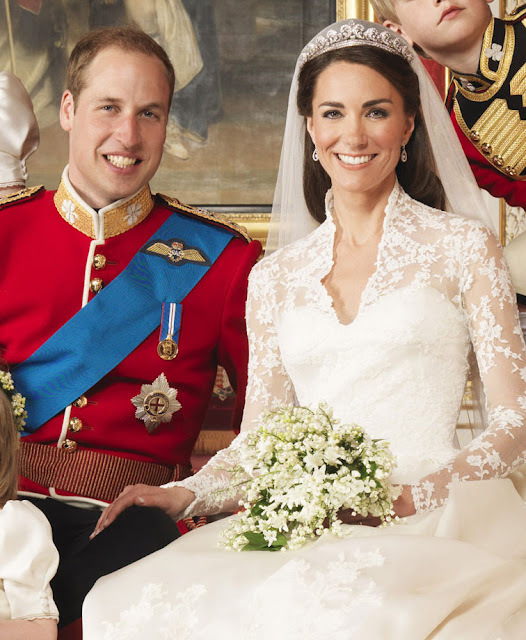 So in anticipation, here are Kate's five sparkliest moments so far. It seems like ages but suddenly the royals are back. A wave of engagements in the last ten days or so has seen some ruling houses back in action and their social media accounts beginning to sparkle and shine once more. We've had water, words of wisdom and white trouser suits - a sunny mix to show just how the royals want to tell their story as the summer of 2015 enters its final phase. Here's the royal week on social media. It is an event that never fails to fascinate despite the passage of time and the sad ending it ultimately had. 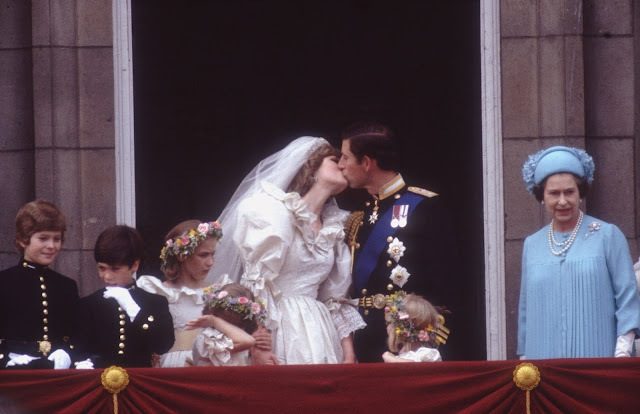 The wedding of Charles, Prince of Wales and Lady Diana Spencer on July 29th 1981 is back in the headlines after previously unseen images of it taken by Lord Lichfield were put up for auction. The behind the scenes photos bring back memories of a day that was enjoyed by billions around the world and which still lingers today. As that one special wedding day makes news again, here are ten already legendary images of Charles and Diana's marriage. What happens when you put royals on a beach? Either a row about invasion of privacy or a photocall with pitfalls including sand and waves. But some manage the beach look with style - here are 8 top moments when royals conquered the sand. 1. Proud parents Beaches can be hard work for royals on a holiday press call. They've got to look relaxed, dress down without going the whole shorts and flip flop route and find interesting things to do while smiling for the camera. 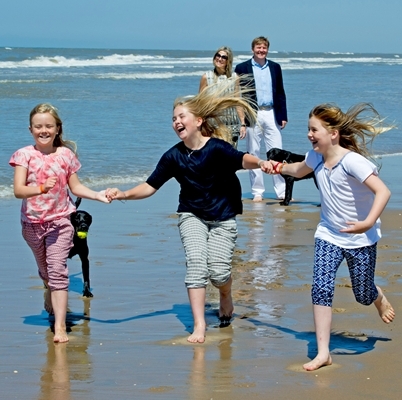 King Willem-Alexander and Queen Maxima of the Netherlands very sensibly opted for the proud parents watching the children route in the summer of 2015 and the result was the perfect royal beach look. As it summer holiday time, the official royal social media accounts are having a bit of a break in general. With most of Europe's reigning families on their breaks, there's little for their Twitter, Instagram and You Tube accounts to report. But there have been a few moments of activity, most of them related to holidays or the weather. You can almost smell the suncream on this week's royals on social media. 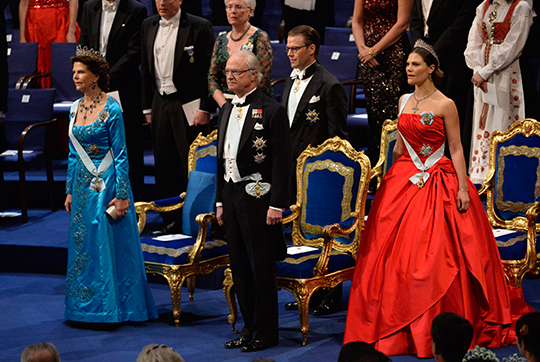 Why isn't Victoria of Sweden on Vanity Fair's Best Dressed List? There are plenty of surprises on this year's best dressed list from Vanity Fair (Samantha Cameron? Really?). But surely up there with the biggest is the omission of Crown Princess Victoria of Sweden from the top ten most stylish women in the world. In a year when this future queen has continually stunned with her wardrobe choices, surely missing her out from the fashion action is a huge oversight? Victoria has worn some cracking outfits this year. Nearly all of them have had a modern edge with a nod to high fashion and following trends with High Street buys. All those attributes are enough to put Queen Letizia on the list and to have sent the Duchess of Cambridge into the Hall of Fame last year so why no place for Victoria? 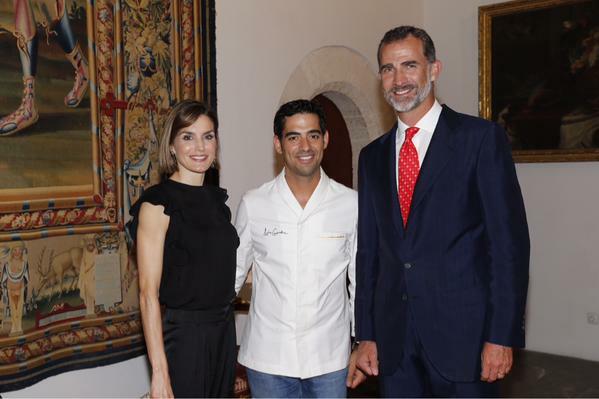 Maybe next year, King Felipe should take the night off. 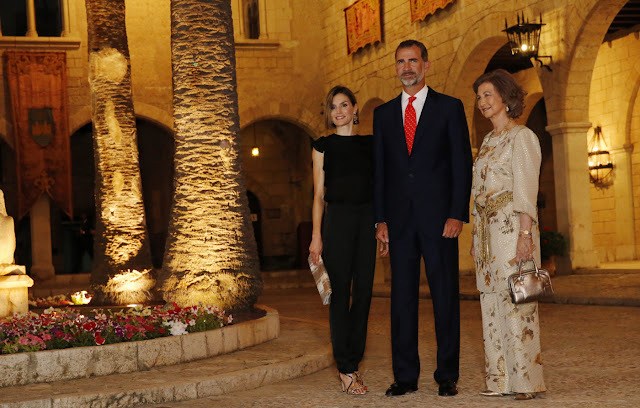 For the second August in a row he has hosted a reception in Mallorca for local authorities but while he might be in charge, all eyes were on the two queens in his life. In 2015, just like his first year as monarch, this particular evening was all about his wife, Letizia, and his mother, Sofia. It may well be that Queen Letizia chose an all black outfit on a dark night in Mallorca as a sign of mourning for her grandfather who died last week at the age of 98. But as she stepped out with her country's other queen, Sofia, they made a sharp contrast against the deep evening light at La Almudaina. One in black, one in gold. The king came too. No one really expected Queen Letizia of Spain to get through a whole appearance without making at least one fashion statement, even if you had to really concentrate to see this one. For her photocall in Mallorca at the start of the royal summer holidays she chose on trend khaki green trousers matched with an equally hot right now white sleeveless top. But the big fashion moment was almost hidden under her famous bob - the queen was wearing a pair of gold earrings shaped like horns. Queen Letizia has never been one for big statement jewels - the closest she's come to that is her much debated tiara bought as an anniversary present for her by Felipe in 2009 and worn for the first time earlier this year. But these earrings certainly got lots of attention and it's easy to see why. They're an unusual look which works well with the casual summer clothes but they're eye catching enough to make a mark all of their own. 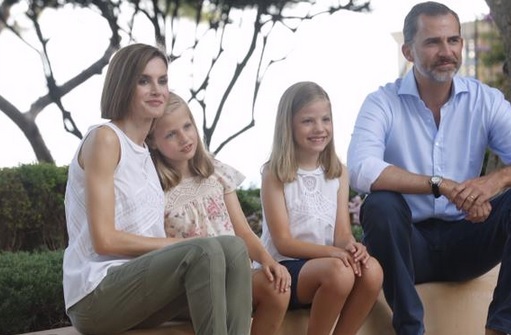 The temperatures might have been soaring across Spain for months now but the traditional family pose at the Marivent Palace in Mallorca always signals the start of the royal summer there. And as dusk began to fall today, Felipe and Letizia began their break with a laid back press call accompanied by their daughters. 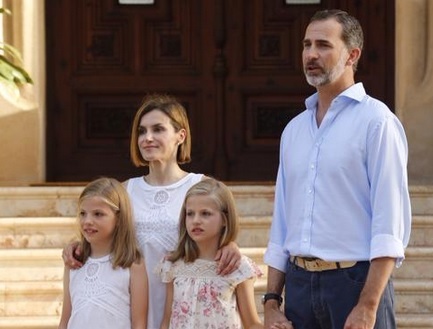 The famous palace steps have been the setting for many famous royal summer photo calls but this one, like 2014, was much smaller than previous years as the Spanish Royals shrink down to a core element of the king, his consort, his heir and the spare. While his father and mother are still part of the official family, they weren't present at the press call although Queen Sofia has been seen on the island in the past days with her eldest daughter, Elena, and her other grandchildren. This evening was all about Felipe and his family.